There was something certainly not right with the feel of that particular month of December. Jekwu’s holidays break from his bank job, once again, turned him into a baker of sweet cupcakes for the family, and he enjoyed tormenting everyone with a secret recipe he had refused to divulge for the last two years — not even to my mother for whom he easily passed as a favorite son. He preferred doing it himself, tying an apron around his waist and whistling Osadebe, while he mixed the icing sugar in a bowl with clods of butter that got his hands messy. Chike would prefer to visit old friends, or play his guitar, seated at the porch on some afternoons with his children, my niece and nephew — making music together. Adankele, my elder sister and best friend was in far away Connecticut, freezing out in the cold in the name of working for a local radio station. She is a reporter. And I was stuck with Mama, Papa, and Nkiru, Chike’s wife, watching CNN on most evenings in the sitting room and barely saying anything to each other; Papa liked it this way — no noise. Especially when the news came on and it bordered on Africa. “Hei! Inukwa o!” he exclaimed on one occasion, adjusting his bulk on the sofa, and motioning towards the TV with a folded tabloid. “So this is how they are using children in Libya for war! Umuaka! Children!” He snapped his fingers repeatedly, and shrugged, then he was calm again. He broke the silence whenever he wanted to. Unless when the kids — Anita and Declan — twins, and first grandchildren of my parents scuttered in and besieged us with their plays. We had to hang the plasma TV higher on the wall because of them, when Chike phoned from Philadelphia to inform us of his home visit. Every year we went home for Christmas. To us it was necessary (Mama made it so), a tradition of some sort, to go to the village during this festive period to celebrate with Grandma, Uncles, Aunties and the extended family. However, everything was different that year. There was no smell of Enugu dust to greet our noses, bath our ankles and color the mouth of our trousers a bright red. There was no artificial Christmas tree standing at a corner in the sitting room, no Grandma, to gather bits of memories about a Grandfather we never knew, and tell it in such a way we actually felt like we’d met him in his lifetime. This was the year 2011, the year we decided to stay back in Lagos and not go for Christmas holidays at Enugu; the year Muammar Gaddafi died. Everybody called, I recall. Virtually everybody. Grandma was the first to call. She called through Auntie Nneka’s phone. She was worried all was not well so Papa put her on loud speaker so she could speak with everyone. Anita and Declan clapped their hands and jumped around in excitement. They were five and the last time they saw Grandma — their great grandmother — was two years before, the year 2009. We all smiled because we remembered it was the best Christmas holidays ever. Everybody came home. Chike and family, Adankele, our stubborn Banker-brother, Jekwu, even Uncle Atan and his Yaoundé wife came home from Cameroon after six years. Her name is Darcelle, and she told me it meant ‘Dark’ — she was black like charcoal. We all lived in a large family house with many rooms and a central sitting room, thanks to Grandpa, whose marbled grave stood at the backyard. Papa bought a big synthetic Christmas tree from the mall, and the children of Uncle Atan; Abigail, Denise, and Eslan, and the twins delighted in taking care of the decorations. They did a good job and we were proud of them. Their bonding was instant, you know kids! Even Declan learnt some easy French by the time we came back to Lagos. There was much to eat and drink. On the 24th of December, Papa and Uncle Atan killed a cow. And the next evening, Christmas day, parcels of packaged fresh meat were distributed to every family in the kindred. There was no better way to celebrate Christmas than to share gifts and food with people around you, Mama would say. The children from other families were gathered and given Cabin biscuits and wraps of Cadbury sweets, and in the evenings, they sat around a smoldering fire to listen to one of Grandma’s folklore stories. I couldn’t help but listen too because no matter how many times I had heard them, Grandma had a way of re-telling a story so that it always captured my attention. Her gesticulations and tone flawlessly impressed me. Darcelle taught me how to make Origami. It was a Japanese thing, and she said her father taught her — he married a Japanese woman to strengthen his entry permit and after that they stuck together. Her mother was distraught, but later settled for sharing her husband with another woman. It was for business, and the good of the family. After all, her father gained permanent residence and sent money from Japan. When he visited Yaoundé, he taught her how to make Origami, and left her mother with another pregnancy; she had four siblings. I told her my father taught me Mathematics and we both chuckled. 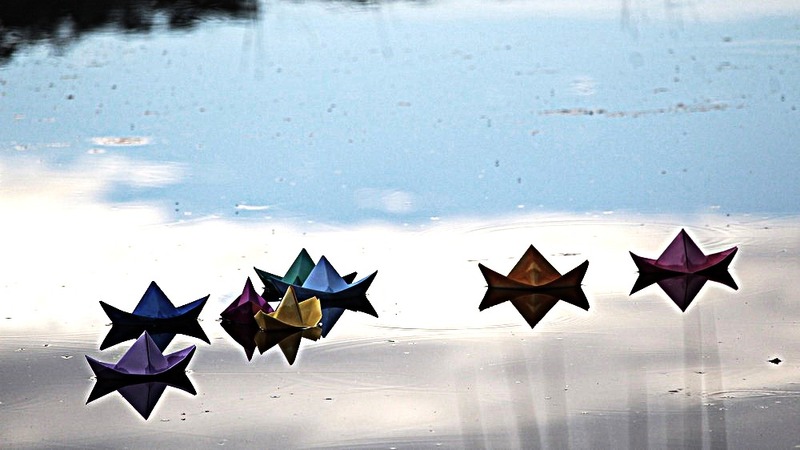 One day we made boat-Origami at the village stream with the kids, and watched as they circled in a whirlpool of current until they disappeared under the surface. 2009 was the same year Adankele got married to her heartthrob. They did everything together; university, internship program, masters degree, and when she called Papa to tell him she wanted to marry an Oyibo man, he obliged, but said they must come down to Nigeria for her traditional marriage. It was customary to come and marry a girl properly from her family in the presence of her father and kinsmen in Igbo land. Papa explained all these to her fiancé and on December 29, 2009, they came and Jekwu baked cupcakes for all the special invitees. It was indeed a season of merriment, seeing my dear sister given out in marriage to Oyibo people who looked awkwardly interesting in our native Ishi Agu regalia. It was also the first time I saw an Oyibo man, and I thought they looked too reddened in the sun. When they got back to Connecticut the next year, they did a court marriage, and Papa and Mama were in attendance. This was where Papa received the diagnosis. Papa had Diabetes Mellitus (type II diabetes). We did not know until he had a cut on the left foot from a shattered ceramic plate and the wound refused to heal; instead it gaped and soon dripped pus. The doctors in Connecticut battled with controlling his blood sugar level which was really high; > 310mg/dl on most occasions, and the cut which had become infected before he appeared at the hospital (they had initially tried simple first aid treatment at home until it got out of hand). Papa’s left leg was amputated below the knee on July 12, 2010, when the area around the cut began to gangrene. For the first time in many years, Papa and Adankele did not come with us to the village that Christmas. Mama said we had to go because she had to monitor the progress of Papa’s new building project, and because Papa approved. Chike flew to Connecticut instead. Their absence was felt, Christmas was dry, and we went back to Lagos earlier than usual, once it was New Year. I made flower-Origami to take my mind off the sadness that hung over the house. He walks with a prosthetic limb now. It hurts at times but he says it is not something he cannot handle. December 2011, we decided not to go for Christmas because Papa was still recuperating, after going through a minor limb reconstructive surgery earlier in the year, and he was learning how to balance and walk with his new plastic leg. He tripped a dozen times but we were glad he didn’t sustain injuries. Adankele called almost everyday, and it was always a call he looked forward to, something that helped calm the anger he felt for his now incomplete body. The kids were always around him too; they painted the leg a deep brown so it could match with Papa’s skin color and he loved it. That year we made lovely Origami, I and the kids. We painted the flowers red and the ducks blue. Declan made Papa a bunch of flowers from it, and presented it to him on the 25th. Mama cried. It was only in the year 2012 that Grandma got to know. That year we all went to Enugu for Christmas again, and Papa organized a thanksgiving.